This song is a Prayer to God for His Grace. Poetry: Vasundhara. Singers: Vasundhara and Thyagarajan. This is a beautiful song performed in front of a live audience in a Carnatic Music Concert. Singers: Vasundhara and Thyagarajan. This is a Hymn that Sri Ramana Maharshi wrote in Tamil at the request of his devotees who wanted Him to offer them a song to sing when they go to request food from householders. Named the “Garland of Words”, it is the Pouring of Divine Love to the Almighty, All-pervading Being. It was written in the attitude of a Beloved longing for the Lover. This beautiful Meera Bhajan was part of a Live Carnatic Music Concert performed by Vasundhara and Thyagarajan. Album: Gaana Jyoti. This is a wonderful song originally rendered by Sri Purandaradasa in Kannada. It is melodious and touching. It is filled with devotion, enough to melt even the hardest hearts. Bhaja Govindam (Worship God) is spiritual. Any sincere seeker of real happiness and peace of mind can benefit from it. It has 31 verses of guidance for Life and Salvation. Sri Adi Sankaracharya found an old man memorizing grammar rules. Due to His compassion, He offered His guidance in the form of this Garland of Gems, explaining the Real Purpose of Life. In this sweet song, Lord Krishna is the manifestation of the One Supreme Being, and the Gopis are the Devotees. It is symbolic of Divine Spiritual Devotion, presented in a simple human manner. Performed by Vasundhara and Thyagarajan. Violin by Krishna Kutti, Mridangam by Shubha Chandramouli. Sri Thyagaraja lovingly calls Sri Sita Devi his Mother and Sri Rama his Father in this beautiful song. Sung by Vasundhara and Thyagarajan in a Live Carnatic Music Concert. This is a beautiful Krithi (song) in Telugu – Aabhogi/Aadhi – originally rendered by Sri Annamacharya. Melodious song that is bound to touch every true devotee’s Heart. Composed by Sri Papanasam Sivan. Sung by Vasundhara and Thyagarajan as part of a Live Carnatic Music Concert. Meaning of the song in English can be found in the description of this video. This beautiful Sanskrit song is great classical music, set in a Raagamaalika (a garland or chain of Raagas). Composed by Swaathi Thirunal. 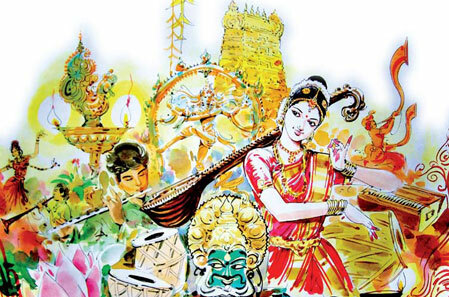 Raagas are: Saaveri, Naattakkurinji, Dhanyaasi, Mohanam, Mukhaari, Poorvikalyani and Madhyamaavathi. Taalam: Roopakam. Singers are Vasundhara and Thyagarajan. This popular Krithi (song) in Hamsadhvani, is usually offered at the beginning of a program. Hamsadhvani – Aadhi. Singers are Vasundhara and Thyagarajan. This is a beautiful Tamil Varnam in Raga Sunaadha Vinodhini, as the first item of a Live Carnatic Music Concert. Singers are Vasundhara and Thyagarajan.